. 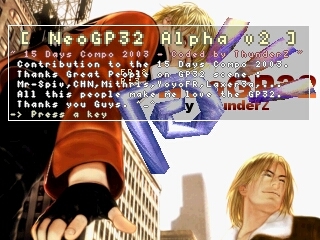 :: NeoGp32 - NeoGeo Pocket Emulator for GP32 by ThunderZ ::..
After my HD crach this summer i loose a lot of data (personal and coding). Upfully i've refound on a old CD the Alpha code source version 1 week after the 15 days compo. So in the same time i work on other project here it's an other contribution to the compo. * First release on the public for this emu. * The TLCS900H (core cpu) and the Z80 (sound cpu) are running for make game run. * The sound output is actually disabled because of crappy sound. * The new gfx engin is on the way so actually some color game are buggy and black and white game are not playable. * SAVE/LOAD state not enabled on this version. Put the emulator on the GPMM directorie. Put your rom file on GPMM\NEOGP32 directorie. Rico, Kojote, Guyfawkes, Mr_Trans and all i forgot.